Roger Federer mastered Rafael Nadal in their first meeting in almost two years to win the Swiss Indoors Basel final 6-3, 5-7, 6-3 on Sunday, claiming a seventh title in his hometown. 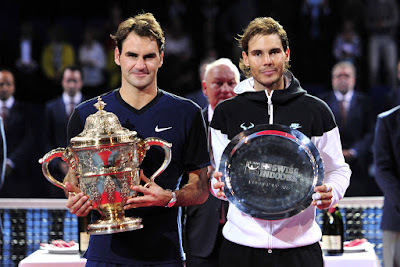 After a 21-month wait, Federer and Nadal renewed their storied rivalry on the indoor hard courts of the ATP World Tour 500 event, with the Swiss winning for the first time since the 2012 BNP Paribas Open in Indian Wells. 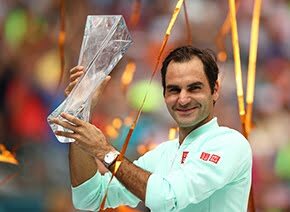 Competing in a record 12th final on home soil in Basel, he added a seventh trophy, a feat he has also achieved at four other tournaments in his career (Wimbledon - 7, Halle - 8, Dubai - 7, Cincinnati - 7). 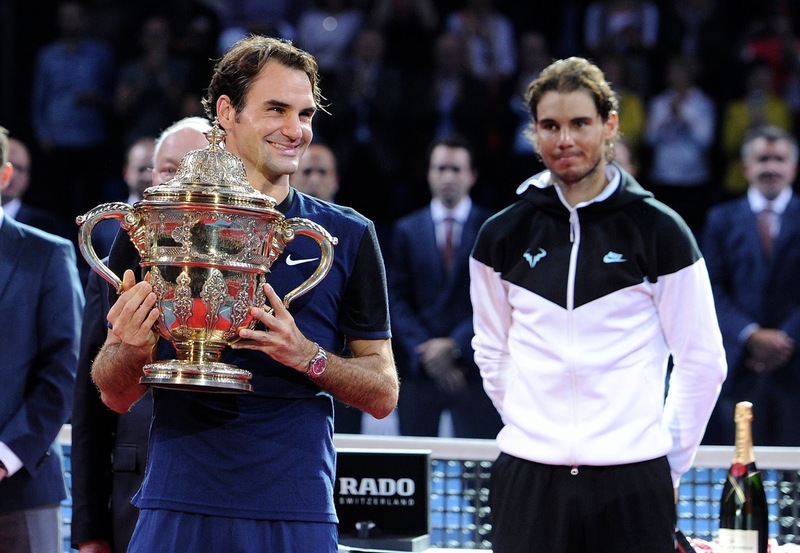 "It was one of my best weeks in Basel, considering everything I've done throughout my career here," said Federer. "I thought the match was close. I had my chances in the second, but he fought back well, like he's done throughout the week really. Overall I was really happy how I played and it was a very special day. "After all the matches and big finals we've played over the years, to have a final here in Basel was amazing for the crowd and for me personally. To come through and win was very special. "I had a good game plan today, everything worked out. The match was high quality and it was entertaining and exciting for both of us as well. The confidence is good, no doubt about that. It's good to get back into the mood of winning after Shanghai. I think the body's gotten used to match play again after all these weeks of not playing." Nadal was looking to make early inroads in the Federer serve and the Spaniard would attack early behind a barrage of deep, penetrating groundstrokes. Federer was forced to save a break point in his first service game following a trio of errors, but the Swiss would quickly regain his composure. The home favourite claimed six of the next seven points and rode the wave of momentum to three break chances of his own at 2-2. 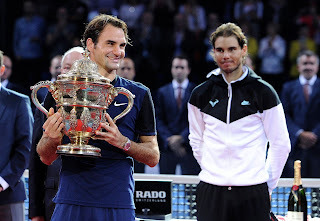 Utilising the fast indoor conditions at the St. Jakobshalle to his advantage, Federer opened the court and refused to give Nadal time to set up his forehand, coming forward often, as he has done all year. One of the points of the tournament came with Federer facing break point in the sixth game. Nadal had the Basel native on the ropes after ripping a backhand approach into the open court, but Federer turned defence into offence in a flash, lunging at a cross-court forehand from well behind the baseline and sneaking it just past Nadal for the stunning winner. He would not look back, breaking to love a few games later to capture the opener 6-3. Federer made a push to run away with the match early in the second set, but Nadal would not go down quietly, saving a break point while serving down 2-3. The margins were razor thin as both players looked to attack with first-strike tennis. The Mallorca native was one step ahead of the top seed in the latter stages of the set and his aggressive mindset would pay dividends, claiming his first break of the match for 6-5 as Federer buried a forehand into the net. Nadal would force a decider with a hold to love. The patterns of play from the first two sets persisted in the third, with both players looking to open the court and keep rallies short. A Nadal double fault in the third game would give Federer a break chance to claim a potentially decisive break, but the Spaniard dispelled any such notion. He would win the battle, but the Swiss would win the war, grabbing the decisive break for 5-3 and serving it out a game later after two hours and three minutes on court. The former Basel ballboy out-aced Nadal 12-0 and struck 44 total winners. He converted on three of seven break points. 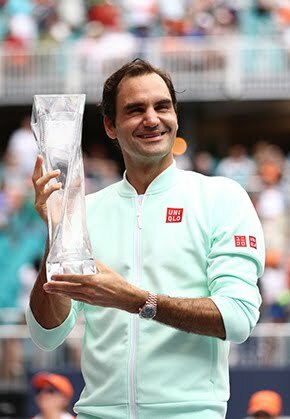 Federer earned his third title this year at an ATP World Tour 500 event, adding to crowns in Dubai and Halle, and 88th of his career at the tour-level. He also emerged victorious in Brisbane, Istanbul and Cincinnati in 2015. Nadal, meanwhile was vying for just his second indoor hard court trophy (Madrid 2005). He falls to 67-31 in tour-level finals and 3-3 this year. "My goal is to get back to my level and be competitive against the top players again and today I was very competitive against one of the best players in the world," said Nadal. "The match wasn't far away from me. He played well and I played well too. The match was very close to win, but I think he served very well in the third. I want to congratulate him for the victory and I had a lot of quality things in my game and mental side to take away from the week." Federer and Nadal had not faced each other in a title match since Nadal's victory at the Rome Masters in May 2013. They last met on court for an Australian Open semifinal that Nadal won in three straight sets in January 2014. The Swiss has now improved to 5-1 against Nadal on indoor hard court surfaces. Nadal, still has a 23-11 hold over Federer, including 14-7 in tournament finals.